DALLAS (AP) Stephen Curry swished a floating one-hander and went to the floor after some contact, looking for a call that wasn’t coming. This time, the Golden State star smiled and ran the other way. 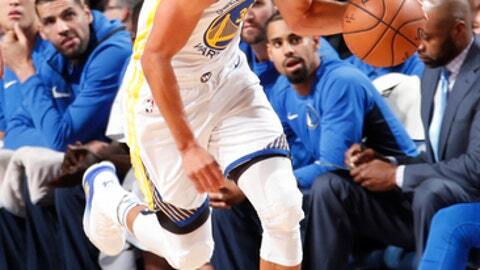 Curry scored 29 points, Kevin Durant added 25 and the Warriors pulled away from the winless Dallas Mavericks in the second half of a 133-103 victory on Monday night. Klay Thompson had 21 points as the defending champs got back to .500 four games into the season, two nights after losing their cool late in a loss at Memphis. Curry was at the center of it, getting fined $50,000 for throwing his mouthpiece on a non-call in the final minute against the Grizzlies. There wasn’t much reason to get worked up this time, even after an 18-point lead early in the second quarter was cut to one before halftime. Golden State never trailed in its seventh straight win in the series. Curry made all five of his shots inside the 3-point line while going 2 of 10 beyond the arc. The most damage was at the line in his third straight game with at least 10 attempts. The two-time MVP was 13 of 13 and has made all 39 free throws this season. Thompson had consecutive 3-pointers to cap a 15-2 run that turned a two-point lead into an 83-68 advantage in the third quarter, sending Dallas to its second straight 0-4 start. The Mavericks lost a franchise-worst five straight to start last season. Wesley Matthews scored 19 points for the Mavericks. Harrison Barnes had 13 points against his former team, matching J.J. Barea and Yogi Ferrell. Rookie Dennis Smith Jr. had 10 points after missing two games with left knee swelling. Durant was 9 of 15 from the field and 4 of 6 from beyond the arc as the Warriors shot 56 percent. The Mavericks trailed 42-24 early in the second quarter before Matthews made all four shots, including a pair of 3-pointers , in a 10-point quarter. Dallas was twice within a point but never had a chance to take the lead. Curry hit two free throws for a three-point halftime lead, then made one before play started in the second half when the Mavericks were called for delay of game. Warriors: Curry became the eighth player to reach 20,000 career minutes for Golden State in the first quarter. … The Warriors improved to 34-7 after a loss under Kerr. … Curry and Draymond Green had eight assists apiece. Green scored 10 points with seven rebounds. Mavericks: Curry’s younger brother, Mavericks G Seth Curry, has missed all four games with a stress reaction in his lower left leg. Coach Rick Carlisle ruled him out this week. … G Devin Harris missed his third straight game since his older brother, Bruce Harris, was killed in a car wreck in Dallas last week. With the game out of hand in the final minutes, Golden State rookie Jordan Bell was free on a breakaway and bounced the ball off the backboard before dunking it. Kerr told Carlisle after the game that he said something to Bell about not showing up an opponent. ”That was a bit much, but it was just a rookie being a little excited there I guess. That’s on us,” said 39-year-old Dirk Nowitzki, in his 20th season with the Mavericks. Warriors: Home against Toronto on Wednesday. Mavericks: Home against Memphis on Wednesday.